Cuba has recently joined the worldwide trend towards negotiating BITs. Its government, which is actively courting foreign capital, often refers to the BITs that Cuba has concluded — over 40 through the end of 1999 — as evidence of a positive climate in Cuba for foreign investment. The purposes of this paper are to assess whether Cuba’s BITs have improved the framework for investment in the island, and to estimate the potential impact of these BITs on the economic measures that the Cuban government may take following the country’s transition to a freemarket society. The paper begins with a brief description of the historical development of BITs and the rationale for their existence. The next section discusses Cuba’s general framework for foreign investment, which provides the legal and economic backdrop for the BITs. The third section examines key provisions of several of the BITs that Cuba has signed. The paper then examines some issues relating to the role of BITs during Cuba’s market transition, and closes with some conclusions on the contributions that BITs have made and are likely to make to foster foreign investment in the country. Over time, it became desirable to develop specialized instruments to address the investment-related concerns that were only partially covered by the FCNs and like agreements. Moreover, the emergence of newly independent states in the 1950s created new opportunities for investment. FCNs and like agreements, which implicitly assumed cultural, political and legal affinity between partner countries, were deemed unsuitable to frame the economic relations between developed countries and these newly independent states. The Cuban revolutionary government nationalized foreign holdings and proscribed all forms of foreign investment in the early 1960s. It was not until 1982 that it issued legislation to permit foreign investment in the island, in the form of joint ventures between foreign entities and Cuban enterprises.16 Although passage of legislation authorizing foreign investment had symbolic value, its practical effect was limited, as it was largely unsuccessful in generating foreign investment flows.17 Further changes to the legal framework for foreign investment were instituted in the 1990s with the adoption of a new foreign investment law, Law No. 77 on Foreign Investment, in September 1995.18 This legislation, combined with an aggressive government campaign to attract foreign investors, has resulted in significant foreign investment locating in Cuba in the second half of the 1990s. Cuba’s regulatory framework for foreign investment consists of (1) the above-mentioned Law No. 77; (2) decrees and regulations implementing that law; and (3) some complementary legislation, such as the tax code, a new mining law, and reforms to the banking system. As will be seen below, the BITs serve to complement this limited legal framework. Wholly-owned foreign investments: Unlike the previous legislation, which limited foreign investors to 49 percent ownership in joint ventures with domestic (state) investors, Law No. 77 allows for the possibility of investments that are 100 percent owned by foreigners. Simplified approval process: Law No. 77 streamlines the administrative approval process for foreign investments. For example, for relatively small and non-sensitive investments, case-by-case approval by the Executive Committee of the Council of Ministers is no longer required, with the approval decision relegated to a Government Commission appointed by the Executive Council.20 Similarly, pursuant to Law No. 77, a decision on whether to approve a foreign investment must be handed down within 60 days from the date on which the request was presented; no time frame for handing down such decision was specified in the previous legislation. Opening up economic sectors to foreign investment: All sectors of the economy are open to foreign investment, subject to approval procedures, with the exception of health and education services and national defense (other than commercial enterprises of the armed forces). Investments in real estate: Law No. 77 for the first time permits foreign investments in the real estate sector. However, such foreign investments are limited to: (1) housing or tourism facilities for the use of persons who are not permanent residents of Cuba; (2) purchase of real estate for corporate activities; and (3) real estate development for the tourism industry. Incentives for investments in export processing zones: Law No. 77 foresees the designation, by the Executive Committee of the Council of Ministers, of areas in the national territory where duty-free zones or industrial parks might operate. The law further provides that certain incentives may be offered to investors who locate in these areas. Foreign investments within the national territory shall enjoy full protection and security and shall not be expropriated, except for reasons of public utility or social interest declared by the Government in accordance with the Constitution of the Republic, legislation in force, and international agreements for the reciprocal promotion and protection of investments subscribed by Cuba, after compensation for their commercial value as determined by mutual agreement and in freely convertible currency. The expropriation of property for reasons of public utility or social interest and with due compensation is authorized. Labor contracting and labor relations: Resolution No. 3/96 of the Ministry of Labor and Social Security, issued on 27 March 1996,24 establishes rules for workers of foreign-invested companies operating in Cuba. The resolution elaborates on Article 33 of Law No. 77, which sets out that workers of foreign-invested companies are hired by an “entity” designated by the Ministry for Foreign Investment and Economic Cooperation and authorized by the Ministry of Labor and Social Security; this entity, in turn, contracts with foreign-invested enterprises for the use of labor. Further, the entity pays Cuban workers their salaries and benefits in domestic currency (pesos), while the foreign-invested enterprise pays the entity in convertible currency. Resolution No. 3/96 also sets out criteria for dismissing workers from foreign- invested enterprises, including for conduct “that affects the prestige that every worker of the enterprise should possess” (Article 15.d) and considered to violate worker “suitability” (idoneidad) standards spelled out in an Annex to the resolution. Application process for foreign investment: Pursuant to Chapter VIII of Law No. 77, Resolution No. 116/95 of the Ministry for Foreign Investment and Economic Cooperation, issued on 1 November 1995, sets out the application process for foreign investment, including documentary requirements and negotiations between foreign investors and the Ministry. 27 It is the responsibility of the Ministry for Foreign Investment and Economic Cooperation to submit the completed investment proposals to the Executive Committee of the Council of Ministers or the Government Commission for approval. Foreign investment registry: Resolution No. 26 of the Chamber of Commerce of the Republic of Cuba, issued on 5 December 1995, creates a registry of foreign- invested enterprises.28 Registration is a prerequisite for operating in the country. The resolution also sets the schedule of fees — in convertible currency — for registering joint ventures or wholly foreignowned corporations and for issuing official certificates of establishment. Regulation of foreign investment: Resolution No. 127/95 of the Ministry for Foreign Investment and Economic Cooperation, issued on 15 December 1995, proclaims regulatory activities of the Ministry over foreign-invested enterprises.29 They include, among others, the requirement of a detailed annual report by each foreign-invested enterprise; rules regarding the establishment of an economic stimulus fund for workers within each enterprise; and procedures for amending the documents establishing individual foreign-invested enterprises and for purchasing motor vehicles by these enterprises. Statistical reporting: Resolution No. 159 of the Ministry of the Economy and Planning, issued on 22 December 1995, sets out statistical information required from foreign-invested enterprises.30 The following information is to be provided to the National Statistical Office either directly by the foreign-invested enterprise or by an agency of the Cuban government that has already received the information: (1) information contained in financial statements submitted to the Ministry of Finance and Prices; (2) information on the work force, submitted by the hiring entity to the Ministry of Labor and Social Welfare; (3) information on exports and imports, submitted to the Ministry of Foreign Commerce; and (4) other information, especially volume of production of goods and services. The Cuban government does not publish the BITs it has concluded. Thus, for this study, we have relied on the BITs as published by Cuba’s partner countries. Obtaining the agreements from the partner country has been made difficult by the fact that few of the Cuba BITs appear to have entered into force.36 It is usually in the context of fulfilling the legal formalities for the entry into force of the BITs — normally the process of ratification by the legislature — that the text of the instrument is published in official legal journals. We have been able to obtain texts of six Cuban BITs (in chronological order of signature): the BITs with Italy,37 Spain,38 Colombia,39 the United Kingdom,40 Chile,41 and Portugal.42 The analysis that follows is based on these six BITs. Scope: The scope of Cuban BITs — framed through the definition of investments, returns, investors, territory, and time period of application — follow closely the general model of other BITs. • concessions granted by domestic law or pursuant to contracts, including concessions to explore, cultivate, extract, or exploit natural resources. The UK46 and Portugal47 BITs specify that a change in the form of assets does not affect their character as investments. The Colombia BIT48 states that “notwithstanding [the definitions in the BIT] … the Government of Colombia will not consider loans as investments for the purposes of this Agreement,” while the Spain BIT49 expressly includes as investments “those loans granted for this purpose, whether or not capitalized.” Despite these differences in scope, it is clear that all BITs are intended to cover most if not all of the vehicles normally utilized in foreign investments. Investment Returns: Most of the Cuban BITs define50 returns on investment (called either “réditos,” “ganancias” or “rentas de inversión” in the Spanish language) as the amounts yielded by an investment, as defined by the BIT. The BITs provide a non-exhaustive list of such returns: profits, interest, capital gains, dividends, royalties, fees, and payments for technical assistance. Investors: For purposes of the Cuban BITs, investors can be either natural persons or juridical entities. The definition of natural person that can benefit from the provisions of the agreement varies across BITs. Under the Colombia and Spain BITs, investors are defined as natural persons who are nationals of one of the two countries; under the Italy BIT, investors are natural persons who are citizens of one of the two countries; under the Chile and UK BITs, investors are nationals of Chile or the United Kingdom and persons who are Cuban citizens; and under the Portugal BIT, investors can be either nationals or citizens of each of the two countries. It is not clear why these differences in definition of natural persons arise, but it would appear that Cuba has a preference for granting the benefits of the agreement to its citizens as opposed to its nationals. Juridical persons or entities defined as investors include companies, business associations and other organizations established or organized under the laws of one of the two countries and headquartered within the territory of that same country. The Chile BIT adds the further requirement that the juridical person or entity also have “its effective economic activities” within the territory of the country. The Italy and UK BITs clarify that the definition of investor for juridical purposes is not restricted to entities that enjoy limited liability. Timing of Application: The Cuban BITs stipulate that they will become effective 30 days after the parties notify each other that they have met their respective constitutional formalities for entry into force; the exception is the Italy BIT, where entry into force commences at the time of notification of completion of formalities for entry into force. The BITs are to be in force initially for 10 years (Italy, Spain, United Kingdom, Colombia and Portugal) or 15 years (Chile); they will be automatically renewed for successive periods of 2 years (Spain), 5 years (Italy), 10 years (Portugal) or indefinite duration (United Kingdom, Chile and Colombia) unless one of the parties gives notice of its intention to terminate it. Investments made prior to the termination of the agreement will be subject to its terms for the same period of time as the agreement’s initial duration (i.e., 10 years for Spain, Colombia and Portugal and 15 years for Chile), with the exception of Italy, in which the period is 5 years, and the United Kingdom, in which it is 20 years. The Chile, Colombia and Italy BITs specify that their provisions will remain in place whether or not there are consular and diplomatic relations between the contracting parties. The BITs apply to investments made after the entry into force of the agreements as well as those made before, as long as investments predating the BIT were lawful. The Chile52 and Portugal53 BITs specify that disagreements or disputes ongoing prior to the entry into force of the agreement would not be subject to the BIT’s dispute settlement provisions. Thus, while the BITs are intended to provide after-the-fact protection to foreign investments already in place, they are not to be used as tools to aid foreign investors in the resolution of their ongoing disputes with the host country. Admission and Treatment: Each of the parties to the Cuban BITs commits to promote, within its territory, investments by investors of the other party, and to admit such investments consistent with domestic law.54 Each of the parties also commits to protect investments of investors from the other party.55 Moreover, each party also commits not to “raise obstacles, through unjustified or discriminatory measures, the management, maintenance, growth, use, expansion, sale or, as appropriate, liquidation of such investments.”56 The Spain BIT specifies that each of the parties will grant all necessary permits required by the investments, and will “permit,” consistent with domestic law, the execution of labor contracts, licensing arrangements, and technical assistance, commercial, financial and management contracts (Article 3.2), as well as arrangements related to the activities of consultants and experts hired by the other party (Article 3.3). • National treatment requires that foreigners (i.e., foreign investors) be treated the same as nationals. Often, national treatment is qualified in BITs to apply to instances where foreign and domestic investors are in “identical” or “similar” situations. Another limitation in some BITs is the so-called “developmental clause,” whereby national treatment is granted to foreign investors subject to the developmental polices of the host country. • Most-favored-nation treatment means that investors from the capital-exporting country concluding the BIT will be granted no less favorable treatment than that given to investors from any other nation. Among the exceptions to most-favored- nation treatment in some BITs is denial of preferential treatment that arises from the host State’s membership in a customs union or a regional organization. The Cuban BITs seek to give effect to these internationally- accepted principles. In the BITs, each party commits to grant to investors of the other party the same treatment (i.e., no less favorable treatment) to that accorded to domestic investors (national treatment) or to investors of a third country (most-favored- nation) treatment engaged in similar activities. With the exception of the Chile BIT, the Cuban BITs also explicitly grant national treatment and most-favored-nation treatment to the returns of investments by investors of the two parties. Investors of one of the Contracting Parties whose investments in the territory of the other Contracting Party suffer losses as a result of wars or other armed conflicts, a state of national emergency and other equivalent events pursuant to international law, shall not receive from such Contracting Party treatment less favorable than that which the latter Contracting Party grants to domestic investors or investors from a third party with respect to restitution, indemnification or other pertinent issues. Compensation pursuant to such losses should be transferred freely and without delay, in convertible currency, in accord with legislation of the Contracting Party where the investments were made. The UK and Colombia BITs extend national and most-favored-nation treatment to compensation from losses to investors from one of the parties that might arise from actions by the other party, such as requisitioning or destruction of their property not required by the needs of the situation. Compensation59 shall be freely transferable and in convertible currency. If the provisions of law of either Contracting Party or obligations under international law existing at present or established hereafter between the Contracting Parties contain rules, whether general or specific, entitling investments by nationals or companies of the other Contracting Party to a treatment more favourable than is provided for by the present Agreement, such rules shall to the extent that they are more favourable prevail over the present Agreement. Transfers: The Cuban BITs commit each of the parties to allow the investors of the other party to transfer freely, in convertible currency and without delay, 62 their investments and any returns thereon. Unless otherwise agreed by the investor, transfers are to be made at the exchange rate prevailing at the time of the transfer. Some of the Cuban BITs specify the same commitments with regard to other forms of transfers, for example funds from the partial or full liquidation of investments (Chile, Spain, Colombia, Italy and Portugal BITs), funds necessary to service debts associated with the investment (Chile, Spain, Italy and Portugal BITs), compensation for losses or awards associated with the resolution of disputes (Chile, Italy and Portugal BITs), and funds for the payment of salaries and other forms of compensation to employees of the investment who have been granted work permits (Spain BIT). The Colombia BIT (Article 6.3) allows either of the contracting parties to restrict transfers in case of “serious balance of payments difficulties”; these restrictions would be in place “for a limited period of time, and would be administered in an equitable manner, in good faith, and on a nondiscriminatory basis.” A protocol annexed to the Chile BIT states that funds can only be transferred starting one year after they have been invested, unless domestic legislation provides for more favorable treatment. Finally, all Cuban BITs contain a subrogation clause, whereby a party may assume the rights of an investor if the party, or an agency of the party, has made one or more payments to an investor to compensate for a non-commercial risk. The value of compensation is to be established on the basis of the “genuine” value of the investment at the time immediately preceding the taking or announcement of the action, and should include interest until the date of payment calculated using a normal commercial rate. Two of the agreements (Chile and Italy BITs) provide that if there is no agreement between the parties on the commercial interest rate, the LIBOR (London Inter Bank Offer Rate) rate is to be used. The Cuban BITs provide that the investor subject to the expropriation shall have recourse to judicial authorities in the host country to challenge the legality of the expropriation action or the value of compensation. The exception is the Spain BIT, which indicates that disagreements regarding the amount of compensation should be resolved via the dispute settlement procedures in the Agreement. Dispute Settlement: The Cuban BITs contain mechanisms to deal with disputes that may arise between states and between an investor or investors and the state. State-to-State Disputes: Cuban BITs provide that disputes between the parties regarding the interpretation and implementation of the agreement should be resolved, to the extent possible, through diplomatic means (Italy, UK, Colombia and Portugal BITs) or “friendly consultations” (Spain and Chile BITs). If after 6 months64 this approach has not been successful, either of the parties may request the formation of an ad hoc arbitral panel following the rules set out in the agreement. • in the eventuality that the President of the International Court of Justice is of the nationality of one of the contracting parties or is unable to fulfill the responsibility of making the appointments, the task shifts to the Vice President of the Court, to the senior member of the Court who is not a national of one of the parties, and so on. The Cuban BITs follow this international practice. Differences between an investor from a party to a Cuban BIT and the other state should be resolved, in the first instance, through friendly consultations. If such consultations fail in resolving the differences, within 6 months from the request for consultations (3 months in the UK and Chile BITs), the investor may request73 that the dispute be submitted to a dispute resolution body. • Italy: (a) the competent tribunal of the country where the dispute has taken place; or (b) an ad hoc arbitral panel, constituted in accord with the provisions in the agreement for state-to-state disputes. • Spain: (a) the competent tribunal of the country where the controversy has taken place; (b) an ad hoc arbitral panel, constituted in accord with the UNCITRAL Arbitration Rules; or (c) the International Court of Arbitration of the International Chamber of Commerce. • United Kingdom: (a) the International Court of Arbitration of the International Chamber of Commerce; or (b) an international arbitrator or an ad hoc arbitral panel constituted in accord with the UNCITRAL Arbitration Rules. • Colombia: (a) the competent tribunal of the country where the dispute has taken place; or (b) an ad hoc arbitral panel, constituted in accord with the provisions in the agreement for state-tostate disputes and operating in accord in accord with the UNCITRAL 1976 Arbitration Rules. • Chile: (a) the competent tribunal of the country where the dispute has taken place; (b) an ad hoc arbitral panel, constituted in accord with the UNCITRAL Arbitration Rules; or (c) an ad hoc arbitral panel, constituted in accord with the provisions in the agreement for state-to-state disputes. • Portugal: (a) the competent tribunal of the country where the dispute has taken place; (b) the International Court of Arbitration of the International Chamber of Commerce; or (c) an ad hoc arbitral panel, constituted through special agreement among the parties or in accord with the UNCITRAL Arbitration Rules. Article 4 of a Protocol annexed to the Portugal BIT provides that, should the parties be signatories to the Convention on the Settlement of Investment Disputes between States and Nationals of Other States, investor-state disputes may be referred to the International Centre for the Settlement of Investment Disputes. As noted earlier, Cuba is not currently a signatory to such Convention and therefore this arbitration venue is not currently available. The Spain BIT adds that the arbitration will be based on: (a) provisions of the BIT and other agreements between the parties; (b) generally accepted rules and principles of international law; and (c) domestic law of the party where the investment was made, including rules regarding legal disputes. The BITs are silent on time frames for the commencement of the arbitration process. The UK BIT provides that, if after three months from the date of the request, the arbitration venue has not been agreed by the parties (recall that in the UK BIT, the two parties have to agree on the arbitration venue), the arbitration venue itself can become the subject of arbitration, in accord with UNCITRAL Arbitration Rules. The Spain and Chile BITs proclaim that arbitral awards will be final and binding; they will be executed in accord with the law of the country where the investment was made. The Portugal BIT proclaims that arbitral awards will be binding for all parties and will only be subject to appeal only to the extent that such process is available within the arbitration venue. The Chile and Portugal BITs specify that once the arbitral process has begun, the parties shall refrain from dealing with the disputed issue through diplomatic means. Once an arbitral award has been made, the parties might engage in a diplomatic dialogue to promote the enforcement of such award. This section of the paper discusses the current significance of Cuban BITs in two respects: (1) the contribution they make to Cuba’s overall legal framework for foreign investment; and (2) their impact on attracting foreign investment into the island. • As discussed above, the BITs with Chile and the United Kingdom also call for compensation to be “immediate, adequate and effective” and in the BIT with Colombia, “prompt, adequate and effective,”77 while the others use a somewhat different formulation, calling for compensation to be “adequate” (Italy), “immediate” (Portugal), and “without unjustified delay and adequate” (Spain). Thus, in this area at least some of the BITs create a more favorable compensation standard for the foreign investor than the vague “proper” standard set forth in the Cuban legislation. For disputes between investors and the host state, BITs give the investor the choice of whether to submit to domestic or international arbitration; in 5 of the BITs reviewed (Spain, United Kingdom, Colombia, Chile and Portugal), investors may submit a dispute with the host country to an ad hoc panel operating in accord with UNCITRAL rules, while in two of the BITs (Spain and the United Kingdom) the dispute may also be submitted to the Court of Arbitration of the International Chamber of Commerce. Given that an instrumentality of the Cuban State is always one of the joint venturers, the BITs might allow a dispute between business partners to become subject to international arbitration.80 In this respect, the BITs may provide substantial additional protection to some foreign investors in Cuba by giving them access to international dispute-resolution mechanisms that may provide fairer and more effective procedures than resort to Cuban courts. Meanwhile, an organization with contacts in Cuba has reported that “committed/realized” foreign investment from 1990 through March 20, 1999 was $1.767 billion.86 This last source also contains information on the magnitude of foreign investment in the island by country of origin; these data are reported in Table 2. According to this source, Cuba’s six largest sources of foreign investment were Canada, Mexico, Italy, Spain, France and the United Kingdom. 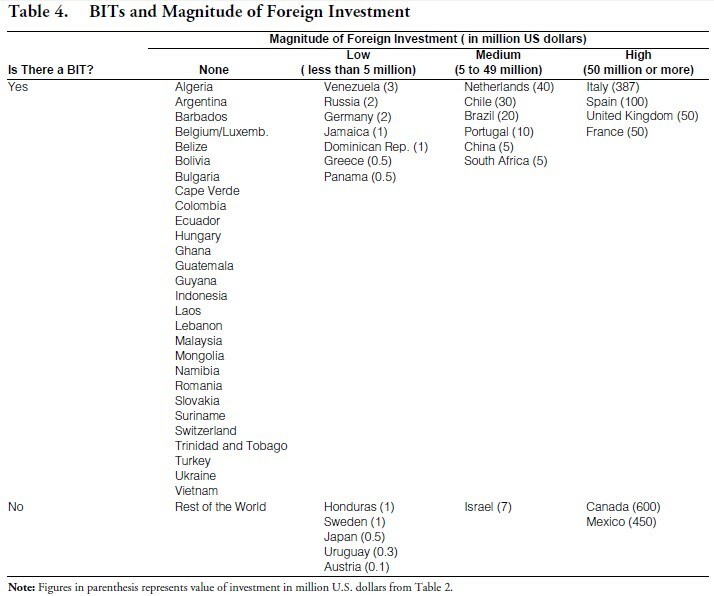 Table 4 combines information on the existence of BITs with magnitudes of foreign investment. The first row of the table lists countries with which Cuba has concluded a BIT, while the second row does the same for countries with which Cuba has not concluded a BIT. 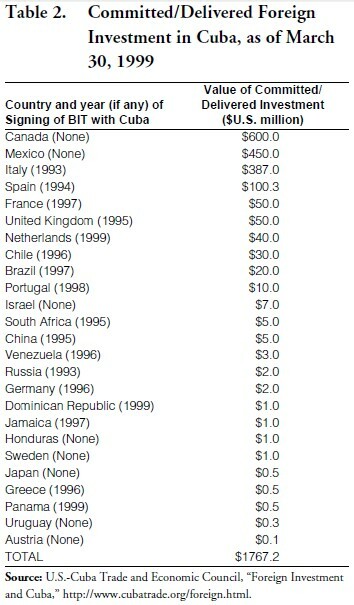 The columns list countries according to the magnitude of foreign investment their nationals have made in Cuba through March 10, 1999, based on the information in Table 2; the amount of investment in million U.S. dollars is given in parenthesis for each country that has non-zero investment. It should be noted that the range of the amount of investment is very wide, with investment as small as $100,000 (from Austrian nationals) reported in the table. All things considered, it can be concluded that for the citizens of a capital-exporting nation, the existence of a BIT between their country and Cuba should be a positive factor, albeit not a decisive one, in the decision whether to invest in Cuba. This is so because the BIT provides some protection to the investor beyond that which he can obtain through direct negotiations with its prospective Cuban partner. In addition, the signing of a BIT is a clear message that Cuba, at least for the time being, intends to respect and give adequate legal protection to foreign investment in the island. Finally, the signing of a BIT signals to the citizens of a country that their government stands ready to act to protect their interests in the event of an investment dispute in Cuba. An interesting additional question is whether the advantages now afforded by the BITs that Cuba has signed with many nations will remain available to those nations’ citizens when Cuba makes a transition to a free-market society. This question will be examined in the next section. This section addresses some BIT issues that are likely to arise when Cuba starts its transition to a free-market society. The discussion that follows assumes that Cuba is moving towards a market economy and is seeking to resume trade and other economic relations with the United States. A post-transition environment may present Cuban leaders with the opportunity to reexamine the economic relationships that have been established with other countries and decide whether Cuba wishes to continue to encourage investment by citizens of those countries. This section discusses the impact that the BITs that Cuba has signed could have on these issues and other aspects of the country’s foreign investment policies. Should Cuba Continue Entering Into BITs? On the whole, it appears that the potential stimulation of foreign investment provided by the BITs outweighs the domestic economic policy limitations introduced by the treaties. Therefore, it is our conclusion that a transition period Cuba should seek to enter into BITs with those countries whose nationals are a potential source of significant foreign investment and with which Cuba has no such treaties at the start of the transition, particularly the United States. Should Cuba Move to Terminate Any of Its Existing BITs? Under well settled international law principles, the BITs executed by Cuba with a number of foreign nations are binding agreements between the contracting states and remain in effect until their expiration or termination.99 In addition, international treaties like the BITs have the same binding effect on countries as their domestic legislation.100 Therefore, the BITs negotiated by Cuba since 1993 should remain in effect unless terminated by one of the parties, and their provisions should be controlling on the domestic policies of the current Cuban government and any successors thereto. Unilateral termination by a party to one of Cuba’s BITs requires in most cases a one year notice.101 Even after termination, investments in place at the time of termination remain protected by the BIT for a period that varies with the treaty, ranging for example from five years for the Italy BIT to twenty for the UK BIT. Therefore, were the Cuban government to terminate any of the BITs, the investments by the nationals of the countries whose BITs were terminated would still enjoy the protection of the BITs for some period of time. The Cuban government may consider seizing properties subject of investment by the nationals of a country with which Cuba has a BIT as part of the process of resolving outstanding expropriation claims involving those properties. As noted earlier, Cuba seized the properties of U.S. and other foreign nationals on the island starting in 1959, and in the vast majority of cases has failed to either return them to their former owners or pay compensation for the expropriations, although it later entered into global settlement agreements with the governments of several countries.102 The expropriation claims of several thousand U.S. nationals and potentially hundreds of thousands of Cuban nationals remain pending and represent a serious and potentially explosive issue that must be addressed early by the Cuban government at the time of the country’s transition to a freemarket economy. If that decision were to be made, the expropriation protection provisions in the BITs could come to be tested. One probable test would come in the event that expropiatory actions by the Cuban government in Cuba were seen as directed exclusively or disproportionately against the nationals of one particular country. Discriminatory actions by a State against the nationals of a foreign country are a violation of international law.107 In addition, as noted above, all Cuban BITs include a prohibition against discriminatory takings of the property of the nationals of the signatory countries. Therefore, any actions by a successor Cuban government directed exclusively against the property interests of the nationals of a country that has signed a BIT with Cuba would be in direct violation of the BIT and should trigger the state-to-state dispute resolution mechanisms described in the previous section. Still another test of the BITs could come if individual investors complained that the actions taken to provide them with compensation for the taking of their assets were deficient (e.g., improper valuation, inadequate or dilatory payments, etc.) Such complaints might trigger not only the mechanisms in the BITs to resolve differences between individual investors and the Cuban State, but also cause a country-tocountry dispute under the BITs. The existence of the BIT provides some assurance to an investor from the country that signed the BIT with Cuba that the current Cuban government or its successor will not take measures that adversely affect the investment without providing adequate compensation. Conversely, the BITs provide a boundary condition that must be observed in setting in place mechanisms to resolve expropriation claims in a transition- period Cuba. Cuba has been somewhat successful in attracting foreign investment in the 1990s. As part of the measures implemented to foster such investment, Cuba has negotiated over 40 bilateral investment promotion and protection agreements, following the formats used internationally for such agreements. The main contributions BITs have made to the framework for foreign investment in Cuba are: (1) to set out more clearly the standard for compensation in potential expropriations of foreign investment; and (2) to give foreign investors the right to take disputes to international tribunals outside of the jurisdiction of the Cuban arbitration system in those instances in which the constitutive documents of a joint venture may not already provide this venue. These improvements to the legal framework are not likely by themselves to have much influence on Cuba’s ability to attract foreign investment in the near future, although their existence probably has an intangible positive impact on the investment climate. 1. Jeswald W. Salacuse, “BIT by BIT: The Growth of Bilateral Investments Treaties and Their Impact on Foreign Investment in Developing Countries,” The International Lawyer 24:3 (Fall 1990), p. 655. 2. United Nations Conference on Trade and Development, Bilateral Investment Treaties in the Mid-1990s (Geneva: UNCTAD, 1998), [hereinafter UNCTAD], p. 10. The United Nations Centre on Transnational Corporations became part of the UNCTAD in 1993. 4. United Nations Centre on Transnational Corporations (UNCTC), Bilateral Investment Treaties (London: Graham & Trotman, 1988) [hereinafter UNCTC], p. 8. According to this treatise, Germany was said to be particularly sensitive to investment protection as its investors had lost their foreign assets in many countries following the two world wars. 5. By the end of 1996, Germany had concluded 113 BITs. See UNCTAD, supra n.4, p. 12. 6. A useful list of BITs concluded during 1959-92, in chronological order as well as by signatory countries, is included as an appendix to Margrete Stevens and Ruvan de Alwis, “References on Bilateral Investment Treaties,” ICSID Review 7:1 (Spring 1992), pp. 229-283. 7. UNCTAD, supra n. 4, p. 10. 8. Rudolf Dolzer and Margrete Stevens, Bilateral Investment Treaties (The Hague: Martinus Nijhoff Publishers, 1995) [hereinafter DOLZER AND STEVENS], p. 10. 9. UNCTAD, supra n. 4, p. 8. 10. DOLZER AND STEVENS, supra n. 10, p. 10; UNCTC, supra n. 6, p. 4. 11. UNCTAD, supra n. 4, p. 9. Most of the early BITs were concluded between Western European countries and African nations. Asian and Latin American countries were less engaged at first in the negotiation of BITs. In the case of Latin America, a significant stumbling block to the negotiation of BITs was the adherence of many countries in this region to a traditional doctrine opposing any international rules on foreign investment, generally known as the Calvo Doctrine. Argentine jurist Carlos Calvo asserted in 1896 that foreign investment should be governed by domestic law and should not be subject to international law rules. See DOLZER AND STEVENS, supra n. 10, p. 8. 12. China signed its first BIT (with Sweden) in 1982, shortly after its opening policy in 1979. Within 5 years, China had signed 17 BITs. See Li Shishi, “Bilateral Investment Promotion and Protection Agreements: Practice of the People’s Republic of China,” in Paul De Waart, Paul Peters, and Erik Denters, editors, International Law and Development (Dostrecht: Martinus Nijhoff Publishers, 1998), p. 164. 13. The United States concluded its first two BITs (with Egypt and Panama) in 1982. For the evolution of U.S. policy regarding protection of foreign investment and the development of the U.S. BIT Program, see, e.g., Kenneth J. Vandevelde, “The BIT Program: A Fifteen-Year Appraisal,” American Society of International Law Proceedings (1992), pp. 532-540. Through March 1999, the United States had signed 44 BITs. See “U.S. Bilateral Investment Treaty Program,” at http://www.ustr.gov/agreements/bit (site last visited April 9, 2000). 14. UNCTC, supra n. 6, p. 10. 15. UNCTAD, supra n. 4, p. 15. 16. “Decreto-Ley No. 50—Sobre asociaciones económicas entre entidades cubanas y extranjeras,” Gaceta Oficial (February 15, 1982) (“Law 50”), pp. 11-15. For commentaries and analysis of the law see, e.g., Chamber of Commerce of the Republic of Cuba, Possibility of Joint Ventures in Cuba (La Habana, 1982); Jean Zorn and Harold Mayerson, “Cuba’s Joint Venture Law: New Rules for Foreign Investment,” Columbia Journal of Transnational Law 21:2 (1982), pp. 272-303; Patrick L. Schmidt, “Foreign Investment in Cuba: A Preliminary Analysis,” Law and Policy in International Business 15:2 (1983), pp.698-710; Lynn Macgilvray-Saltzman, “Cuba’s Joint Venture Associations,” Florida International Law Journal 1:1 (1984), pp. 45-60; Sula Fiszman, “Foreign Investment Law: Encouragement vs. Restriction—Mexico, Cuba and the Caribbean Basin Initiative,” Hastings International and Comparative Law Review 8:2 (1985), pp. 147-183; and Jorge F. Pérez-López, The 1982 Cuban Joint Venture Law: Context, Assessment and Prospects (Coral Gables: Graduate School of International Studies, University of Miami, 1985). For the changes to the 1982 law in the area of property rights see, e.g., Jorge F. Pérez-López, “Islands of Capitalism in an Ocean of Socialism: Joint Ventures in Cuba’s Development Strategy,” pp.190-219, in Pérez-López, editor, Cuba at a Crossroads (Gainesville: University Press of Florida, 1994). 17. Cuba’s first joint venture with a foreign investor was completed in 1990, eight years after Law 50 went into effect. See, e.g., Business International Corporation, “Developing Business Strategies for Cuba” 23 (1992). 18. “Ley No. 77—Ley de las inversiones extranjeras,” Gaceta Oficial (6 September 1995)(“Law No. 77”), pp. 5-12. For legal analyses and commentaries to Law No. 77 see, e.g., Matías F. Travieso-Díaz and Alejandro Ferraté, Recommended Features of a Foreign Investment Code for Cuba’s Free-Market Transition, 21 N.C. J. INT’L L. & COM. REG. 511 (1996); René Burguet Rodríguez, Ley de la Inversión Extranjera en Cuba (Madrid: Consultoría Jurídica Internacional, 1995); Juan Vega Vega, Cuba: Inversiones Extranjeras a Partir de 1995 (Madrid: Ediciones Endymion, 1996); Ghassan Ossman, “Recent Developments Relating to the Role of the Public Administration in Regulating Investment in Cuba,” The Journal of International Banking Law 11:10 (October 1996), pp. 415-423; and Dídac Fábregas I Guillén, La ley de la inversión extranjera y la situación económica actual de Cuba (Barcelona: Viena, S.L., 1998). 19. Law No. 77, art. 12-15. 20. Article 21 of Law No. 77 reserves for the Executive Committee of the Council of Ministers decisions on the following investments: (1) those whose total value (including the national contribution) exceeds $10 million; (2) wholly foreign-owned enterprises; (3) investments in public services such as transportation, communications, water supplies, electricity, or the operation of a public work; (4) those that involve the exploitation of a natural resource; (5) those that entail the transfer of state property or of a right which is the property of the state; and (6) those that involve commercial enterprises of the armed forces. 21. Law No. 77, art. 3. Interestingly, this Article makes explicit reference to the BITs subscribed by Cuba as one of the legal instruments that provide “full protection and security” to foreign investment located in the island. 22. Constitución de la República de Cuba (1992), published in Gaceta Oficial (Aug. 1, 1992) [hereinafter CONSTITUCION DE 1992], art. 25. This provision, which appeared in the Constitution of 1976, was not changed when the Constitution was amended and reissued in 1992. 23. On this legislation and procedures see Burguet Rodríguez, Ley de la inversión extranjera en Cuba, pp. 21-22 and Vega y Vega, Cuba: Inversiones extranjeras a partir de 1995, pp. 47-49. There is a potentially important discrepancy between the CALPA, which foresees valuation of assets by domestic experts and domestic currency, and the provision authorizing the use of international appraisers and valuation in convertible currency in Law No. 77. Also, under the CALPA, appeal procedures are applicable only to domestic courts, whereas Art. 57 of Law No. 77 states: Conflicts that may arise in relations between partners in a joint venture, or between foreign investors and national investors, or between the partners in a wholly foreign-owned investment taking the form of a stock corporation shall be resolved in accordance with the constitutive documents. The same rule shall apply when the conflict arises between one or more partners and the joint venture or the wholly foreignowned corporation with which the foreign partner or partners are associated. A companion article (Art. 58 of Law No. 77) makes it abundantly clear that domestic courts have jurisdiction in disputes regarding the execution of commercial contracts between foreign investors and state enterprises: Disputes over the execution of contracts of joint ventures, foreign investors and domestic investors who are parties to international economic associations and wholly foreign-owned corporations with domestic enterprises and other domestic entities fall under the jurisdiction of the Economic Courts of the People’s Courts, as may be established by the Supreme People’s Court. There is no express right under the above article for foreign investors to refer a dispute regarding execution of a contract by a Cuban enterprise to an international dispute resolution tribunal, but the above-quoted Article 57 permits such referrals if provided in the agreements between the joint venturers. 24. “Resolución No. 3/96, Ministerio de Trabajo y Seguridad Social—Reglamento sobre el regimen laboral en la inversión extranjera,” Gaceta Oficial (24 May 1996), pp. 266-272. 25. “Decreto-ley No. 165—Ley sobre zonas francas y parques industriales” (3 June 1996), http://www2.cuba.cu/negocios/DL165E/ htm. 26. “Procesamiento para la presentación de la solicitud de otorgamiento de una concesión administrativa respecto a una zona franca y su tramitación,” Ministerio para la Inversión Extranjera y la Colaboración Económica (24 October 1996), http://www2.cuba.cu/negocios/ INST1E/htm; “Instrucción Z.F. No. 2/96—Procedimiento para la autorización del establecimiento de operadores en las instalaciones de las zonas francas,” Ministerio para la Inversión Extranjera y la Colaboración Económica (24 October 1996), http:// www2.cuba.cu/ negocios/INST2E/htm; and “Resolución No. 66/96,” Ministerio para la Inversión Extranjera y la Colaboración Económica (24 October 1996), http://www2.cuba.cu/negocios/RESOL66E/htm. 27. “Resolución No. 116/95,” Ministerio para la Inversión Extranjera y la Colaboración Económica, Gaceta Oficial (11 December 1995), pp. 488-490. 28. “Resolución No. 26—Reglamento del Registro de inversiones extranjeras,” Cámara de Comercio de la República de Cuba, Gaceta Oficial (15 December 1995), pp. 504-506. 29. “Resolución No. 127/95—Normas relativas a la actividad de supervisión y control de las Inversiones Extranjeras,” Ministerio para la Inversión Extranjera y la Colaboración Económica, Gaceta Oficial (2 January 1996), pp. 7-15. 30. “Resolución No. 159,” Ministerio de Economía y Planificación, Gaceta Oficial (15 January 1996), pp. 20-21. 31. “Ley No. 74—Del sistema tributario,” Gaceta Oficial (5 August 1994). (Some other taxes that may be applicable to foreign investments and their employees include taxes on the value of assets owned; earned income; sales; consumption of public services; real estate holdings; vehicles; and transfer of property. The tax code also sets employer contributions to social security, user fees (e.g., roads tolls), and charges on advertising of products or services.). 32. “Ley No. 76—Ley de minas,” Gaceta Oficial (23 January 1995), pp. 33-44. (This law is particularly important to foreign entities considering investments in the mining and processing of nickel, copper, gold and other minerals.) 33. Decree-Law No. 172, creating the Cuban Central Bank, and Decree-Law No. 173, setting out the regulations for commercial banks. See “Central Bank of Cuba established,” Granma International Electronic Edition, no. 25 (1997). 34. For an analysis of the requirements of an adequate legal regime for foreign investment in Cuba, see Matías F. Travieso-Díaz and Alejandro Ferraté, Recommended Features of a Foreign Investment Code for Cuba’s Free-Market Transition, 21 N.C. J. INT’L L. & COM. REG. 511 (1996). 35. The treaties break down in terms of geographic location of Cuba’s signing partner as follows: Europe 15, Latin America and Caribbean 14, Asia 6 and Africa 4. The predominance of BITs with European countries is not surprising, given that Europe is the home of many of Cuba’s largest foreign investors. 36. As of July 15, 1996, only three Cuban BITs — with Italy, Spain and the United Kingdom — had entered into force. See “Recent Actions Regarding Treaties to Which the United States is Not a Party: Status of Investment Treaties,” 35 International Legal Materials (1996), p. 1133. 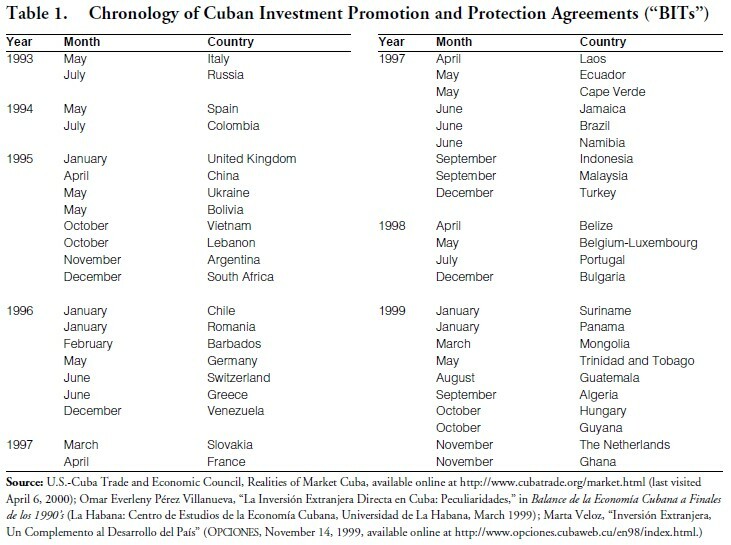 This same information regarding BITs that have entered into force is given in the database of the Centre for Settlement of Investment Disputes, www.worldbank.org/icsid/treaties/cuba.htm. Typically, for a BIT to become effective, it must be ratified by the parliament or other legislative bodies of both countries. Apparently, action by the legislatures of most countries with which Cuba has negotiated BITs has been slow. 43. There is a great deal of commonality in BITs. Countries contemplating their negotiation typically have already negotiated similar agreements with other countries or have available model agreements. Significant in the convergence of the substantive provisions of BITs has been the work of the Organization for Economic Cooperation and Development (OECD), whose 1967 Draft Convention on the Protection of Foreign Property served as a basis for the model treaties of many developed countries, and the Asian-African Legal Consultative Committee, which developed model agreements used by many developing countries. Also noteworthy in this regard is the work of the United Nations Centre on Transnational Corporations, which has collected, analyzed and disseminated the large body of BITs, making such information widely available to potential BIT signatories. See generally, DOLZER AND STEVENS, supra n. 10. 44. This rationale is not included in the Chile BIT. 45. The further clarification that the investment be in accord with domestic legislation of the host country is not present in the UK and Colombia BITs. 46. UK BIT, Article 1. 47. Portugal BIT, Article 1. 48. Colombia BIT, Article 1. 49. Spain BIT, Article 1. 50. The Chile BIT does not define the term returns. 52. Chile BIT, Article 2. 53. Portugal BIT, Article 11. 54. The Chile BIT (Article 3) is silent on the commitment to admission of investments. 56. The quote is from the Spain BIT, Article 3.1. Very similar language is included in the other BITs. 57. UNCTC, Bilateral Investment Treaties, pp. 46-47. 59. The UK BIT foresees compensation either in the form of restitution or adequate compensation. The Colombia BIT explicitly provides for restitution in the case of property requisitioned by the authorities of a party, and adequate compensation in the case of destruction of property. 60. The Spain BIT clarifies that the taxation instruments in question include double taxation agreements. 61. Under Cuban law, the country’s citizens are only allowed very limited economic/commercial activities, and none that would qualify them as “domestic investors” as the term is usually understood. The most significant activities for private gain permitted in Cuba are those related to food production and distribution, as agriculture was the only sector of the economy not taken over by the state in the early 1960s. Before they are able to sell their output directly to the public, private farmers must sell a predetermined amount to the state for distribution through the acopio system. In September 1993, the Cuban Council of State passed legislation that ratified the concept of self-employment and provided the basis for its expansion (“Decreto-Ley No. 141—Sobre el ejercicio del trabajo por cuenta propia,” Gaceta Oficial (8 September 1993), p. 11); subsequently, the Ministries of Labor and Social Security and of Finance issued regulations identifying occupations (in the services sector) in which self-employment would be permitted and setting out rules governing such selfemployment, including permits, fees, taxes, and prohibitions, such as hiring helpers or employees and professionals engaging in self-employment in their professional field. (“Resolución Conjunta No. 1 CETSS-CEF,” Gaceta Oficial (8 September 1993), pp. 11-14.) On these forms of private enterprises in Cuba see Jorge Pérez-López, Cuba’s Second Economy (New Brunswick: Transaction Publishers, 1995). However, state-owned enterprises do engage in a wide range of economic/commercial activities, often in partnership or “joint venture” with foreign investors. 62. The Portugal BIT defines “without delay” as occurring within 30 days of the request for transfer; the Chile BIT as 60 days; and the Spain BIT as 3 months. 63. All these formulations echo to a degree the “Hull Formula,” in reference to former U.S. Secretary of State Cordell Hull who, in a diplomatic note of August 22, 1938 to the Mexican Ambassador regarding the Mexican expropriations of U.S. agrarian and oil properties, declared that “under every rule of law and equity, no government is entitled to expropriate private property, for whatever purpose, without provision for prompt, adequate and effective payment therefor.” Henry J. Steiner, Detlev E. Vagts, and Harold Hongju Koh, Transnational Legal Problems: Materials and Text, Fourth Edition (Westbury, New York: The Foundation Press, 1994), p. 458. 64. Three months in the Italy BIT; there is no time limit in the UK BIT. 65. In the Chile and Portugal BITs, the president of the arbitral panel must be national of a country that has diplomatic relations with both parties. 66. Three months in the Italy BIT. 67. In the Chile BIT, the time limits are 30 days to select the candidate for head of the panel and 30 days for the countries to approve such selection. 68. The Colombia BIT indicates that the contracting parties might establish the rules of procedure for the panel. 69. The UK and Portugal BITs foresee the possibility that the panel might decide to divide the latter costs other than equally. 70. The Convention on the Settlement of Investment Disputes between States and Nationals of Other States (the Convention) came into force on October 14, 1966; 146 States (Cuba excluded) had signed the Convention as of October 1998. The International Centre for Settlement of Investment Disputes (ICSID), which operates as part of the World Bank Group, was created in 1966 pursuant to the Convention. ICSID provides facilities for the conciliation and arbitration of disputes between member countries and investors who qualify as nationals of other member countries. Recourse to ICSID conciliation and arbitration is voluntary; however, once the parties have consented to ICSID arbitration, neither can unilaterally withdraw its consent. Moreover, all Convention signatories, whether or not parties to the dispute, are required by the Convention to recognize and enforce ICSID arbitral awards. See http://www.worldbank. org/icsid/about/main.htm. 71. The Convention on the Recognition and Enforcement of Arbitral Awards (New York, 1958) came into force on June 7, 1959. Cuba ratified this Convention on December 30, 1974, and it entered into force in Cuba on March 30, 1975. See http:/www.uncitral. org. In 1976, UNCITRAL issued Arbitration Rules which provide a comprehensive set of procedural rules upon which parties may agree for the conduct of arbitral proceedings arising out of their commercial relationships. The text of the 1976 UNCITRAL Arbitral Rules are available at http://www.uncitral.org/english/texts/arbconc/arbitrul.htm. 72. The International Chamber of Commerce, founded in 1919 and headquartered in Paris, is the foremost world business organization, holding consultative status at the highest level with the United Nations and its specialized agencies. In 1923, the ICC founded the International Court of Arbitration to conduct international commercial arbitration, settling disputes in a final and binding manner. The Court operates pursuant to Rules of Arbitration first issued in the 1970s and revised periodically thereafter. See http://www.iccwbo. org. 73. The Italy, Spain, Chile and Colombia BITs are clear in stating that the decision of what dispute settlement venue to use is the choice of the investor. The UK BIT seems to grant this right to the investor to seek international arbitration, but suggests that the decision on the venue to use is to be made by both parties. The Portugal BIT indicates that either of the parties could make the decision to seek arbitration and decide on the venue. 74. Matías Travieso-Díaz, The Laws and Legal System of a Free-Market Cuba (Westport: Connecticut: Quorum Books, 1996), p. 114. 75. On the expropriation of foreign property by the Cuban government in the early 1960s see, e.g., Paul Sigmund, Multinationals in Latin America: The Politics of Nationalization (Madison: University of Wisconsin Press, 1980). 76. This is particularly important in the Cuban context because, in the early years of the Revolution, Cuba singled out for expropriation the assets of U.S. nationals, causing the United States to denounce the expropriations as unlawful. See, e.g., United States Protests New Cuban Law Directed at American Property, 43 Dep’t State Bull. 171 (1960). For a detailed description of the process by which Cuba expropriated the assets of U.S. nationals, see Michael W. Gordon, THE CUBAN NATIONALIZATIONS: THE DEMISE OF PROPERTY RIGHTS IN CUBA 69-108 (1975). 78. According to Vega y Vega, Cuba: Inversiones extranjeras a partir de 1995, p. 194, some of the joint ventures established pursuant to Law No. 50 of 1982 designated Arbitral Courts outside of Cuba, including UNCITRAL rules. 79. Vega y Vega, Cuba: Inversiones extranjeras a partir de 1995, p. 194. 80. There is a considerable question, however, whether a Cuban entity entering into a joint venture with a foreign investor will be deemed to be an extension of the Cuban state such that a dispute between the foreign investor and its Cuban partner becomes a dispute between a foreign investor and the State such as to trigger the dispute resolution provisions of the BIT. In the United States, there is a presumption of separate juridical status by a state instrumentality from the State itself; this presumption can be overcome under two circumstances: when the corporate entity is so extensively controlled by the State that a relationship of principal and agent is created, and when to recognize the separation would work fraud or injustice or defeat overriding public policies. First National City Bank v. Banco Para el Comercio Exterior de Cuba, 462 U.S. 611, 629-30 (1983); Alejandre v. Telefonica Larga Distancia de Puerto Rico, 183 F. 3d 1277, 1284-95 (11th Cir. 1999). The party claiming that the instrumentality is not entitled to separate recognition bears the burden of proving so. See Alejandre, supra; 905 F.2d 438, 447 (D.C. Cir., 1990). 81. Cited in Business International Corporation, Developing Business Strategies for Cuba (New York: Business International Corporation, 1992), p. 24. 82. “Carlos Lage Addresses Conference 21 November,” Havana Tele Rebelde Network (23 November 1994), as reproduced in FBISLAT- 94-229-S (29 November 1994). 83. “Support for Economic Changes,” Havana Radio Havana Cuba (12 July 1995), as reproduced in FBIS-LAT-95-137 (18 July 1995). 84. Information released by Osvaldo Martínez, Director of the Center for the Study of the World Economy, as reported from La Habana by EFE (17 May 1998). 85. Banco Nacional de Cuba, Economic Report 1994 (La Habana, August 1995) and Informe económico 1995 (La Habana, May 1996); Banco Central de Cuba, Informe económico 1997 (La Habana, May 1998) and Informe económico 1998 (April 1999). These figures are reported in pesos and converted to U.S. dollars at the official exchange rate for commercial transactions of 1 peso = 1 U.S. dollar, even though the exchange rate of the peso in exchange houses operated by the Cuban government is about 20 pesos for one U.S. dollar. 86. U.S.-Cuba Trade and Economic Council, Inc., “Foreign Investment and Cuba,” at http://www.cubatrade.org/foreign/htm, last visited Apr. 10, 2000. 87. Based on information presented in Omar Everleny Pérez Villanueva, “La inversión extranjera directa en Cuba: Peculiaridades,” mimeographed (1998), p. 16. 88. Philip Peters, A Different Kind of Workplace: Foreign Investment in Cuba (Arlington, Virginia: Alexis de Tocqueville Institution, March 1999), p. 9. 89. Many of the countries with which Cuba has negotiated BITs (e.g., Belize, Cape Verde, Laos, Namibia, Suriname) are less advanced developing countries that are unlikely to have capital to invest in Cuba. Thus, it would seem that Cuban BIT-making is at least in part politically motivated, using these instruments to signal friendship between nations and confluence of political agendas. This is not a phenomenon unique to Cuba. The United States, for example, has also entered into certain BITs, at least in part, to further the country’s political objectives. See Vandevelde, “The BIT Program,” p. 539. 90. Salacuse, “BIT by BIT,” p. 673. 91. UNCTC, Bilateral Investment Treaties, p. 14. 92. According to the ICSID database, Canada has been a fairly active participant in BITs, with 17 such agreements concluded through the end of 1996. The same source only records two BITs for Mexico through the end of 1996. The database is given at http:// www.worldbank.org/icsid/treaties/main.htm. 93. Because BITs are reciprocal agreements, some of Cuba’s BITs might be seen as seeking to protect future Cuban investments abroad. A Cuban analyst refers to over 100 enterprises in foreign countries operating with Cuban capital, although most of these appear to be sales/marketing offices for Cuban state-owned enterprises. Pérez Villanueva, “La inversión extranjera directa en Cuba: Peculiaridades,” p. 27. Some enterprises which do appear to represent Cuban investments in the manufacturing and services sectors include: (1) In Mexico, BIOTER, a Cuban-Mexican joint venture producing soybean derivatives, and Agroingeniería, S.A. de CV, a company producing agricultural implements located in the Mexican state of Michoacán; (2) In Vietnam, a construction company that began operations in 1995 and several joint ventures operating cattle farms; (3) In Uganda, Labiofam Pharmaceutical Uganda, Ltd., a joint venture that produces medical products, serums and children’s food supplements. Id., pp. 27-30. However, Cuba’s status as a capital-importing nation and its current economic crisis make it unlikely that Cuba will be the source of many significant investments in other countries for the foreseeable future. 94. As is well known, the United States has in place a comprehensive embargo against trade and other economic transactions involving Cuba. The embargo is founded on several statutes, and is implemented by detailed regulations, the Cuban Assets Control Regulations (CACR), issued and administered by the U.S. Department of the Treasury. For a detailed discussion of the U.S. trade embargo and its legal foundations see Matías Travieso-Díaz, The Laws and Legal System of a Free-Market Cuba (Westport: Connecticut: Quorum Books, 1996), Ch. 2. 95. Two implicit assumptions in this discussion are (1) that Cuba is unlikely to become a major capital-exporting country in the foreseeable future, so it will not need to enter into BITs to protect the interests of its investors abroad, and (2) that whether Cuba should enter into additional BITs with developing countries is an interesting political question whose answer should have no material impact on bringing additional investment into Cuba. 98. Imposing such limitations on the government’s ability to act is not necessarily a bad result from the economic standpoint. For example, avoiding protectionist measures may be a good economic policy, and the existence of prohibitions in the BITs against such measures may serve to fend off attempts by local interests to achieve privileged positions. 101. The Spain BIT requires only six months notice. 102. For a detailed discussion of the Cuban expropriation issue see Matías Travieso-Díaz, The Laws and Legal System of a Free-Market Cuba (Westport: Connecticut: Quorum Books, 1996), p. 71-104. 103. Pub. L. No. 104-114, 110 Stat. 785, codified in scattered sections of 22 U.S.C. 104. Section 4(13) of the Helms-Burton Law states that a person “traffics” in confiscated property if “that person knowingly and intentionally — (i) sells, transfers, distributes, dispenses, brokers, manages, or otherwise disposes of confiscated property, or purchases, leases, receives, possesses, obtains control of, manages, uses, or otherwise acquires or holds an interest in confiscated property, (ii) engages in a commercial activity using or otherwise benefiting from confiscated property, or (iii) causes, directs, participates in, or profits from, trafficking (as described in clause (i) or (ii)) by another person, or otherwise engages in trafficking (as described in clause (i) or (ii)) through another person, without the authorization of any United States national who holds a claim to the property. 106. See Matías Travieso-Díaz, The Laws and Legal System of a Free-Market Cuba (Westport: Connecticut: Quorum Books, 1996), p. 71-104, for a discussion of potential methods for the resolution of outstanding expropriation claims by U.S. and Cuban nationals. 107. See, e.g., Banco Nacional de Cuba v. Sabbatino, 193 F.Supp. 375, 385 (S.D.N.Y. 1961), aff’d, 307 F.2d 845 (2d Cir. 1962), rev’d on other grounds, 376 U.S. 398 (1964). 108. As noted earlier, both Art. 25 of the current Cuban Constitution and Law No. 77 recognize the right of the State to expropri ate foreign investments, but only “for reasons of public utility or social interest” and subject to the payment of compensation for “the commercial value” of the property being expropriated. 109. As indicated earlier, the various BITs include different descriptions of the compensation formula, but they all have in common the requirements that the payment must be prompt and adequate and based on the fair market value of the investment at the time of the taking. 110. This does not necessarily mean that the investor would prevail in the dispute or that Cuba would be required to pay damages for the taking of the investor’s property. The question whether foreign investors in Cuba have acquired good title to their assets is one that will need to be decided in the Cuban courts; the answer to that question would in part dictate the ultimate outcome of any investor-initiated arbitration.